This past Sunday, I ran my first half marathon. A year ago, I never could have imagined that I was capable of running 13.1 miles. I would have told you that half marathons are for crazy people, because no sane person would ever run that far by choice. But now...I guess I've become one of those crazy people! I started running last May because I wanted to do cardio exercise more regularly and improve my fitness for health purposes. I slowly built up my mileage over several months and found that I really enjoyed long runs, even in sub-freezing temperatures. I eventually decided to run the Half of Quincy and couldn't have asked for a better experience for my first half marathon. 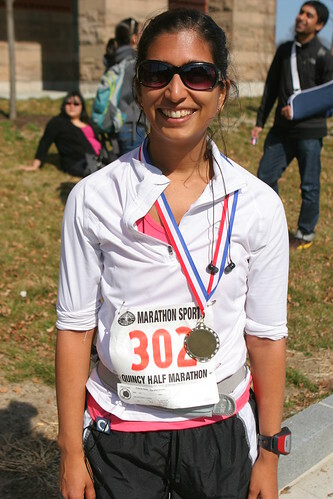 The weather on Sunday was gorgeous, and the first few miles of the race were along the ocean, which I loved. My training paid off and I felt great on race day, although I'll admit that miles 11-13 were very challenging, both mentally and physically. My goals for the race were pretty modest, since I'm a new runner - I wanted to run/jog the whole thing without walking breaks, and I wanted to finish with a smile on my face. I'm proud to report that I accomplished both those things, and I already can't wait to do it again! While I was training, I made a conscious effort to refuel properly after running. I wasn't trying to lose weight, so I tried to replace the calories I was burning by adding some healthy snacks to my routine. One of my go-to snacks was granola bars. I tend to find that packaged granola bars are often too sweet, too dry, or have some components (like certain nuts or fruits) that I don't care for. So it seemed obvious that I should develop a recipe of my own that is suited to my particular tastes! This granola bar recipe went through a couple iterations - the first version I made had nice flavor but the texture was too soft and the bars didn't hold together well. I made several changes and finally ended up with this version, which I love. The texture is chewy rather than hard, but the components of the bars still have good crunch. They are full of ingredients that you can feel good about, and have really great flavor with just the right amount of sweetness. I'll definitely be keeping a supply of these bars around as I train for my next race! Feel free to play around with the ingredients and tailor the recipe to your taste. You could use different nuts, add toasted coconut, add more dried fruit, change the spices, use sunflower seeds instead of sesame, etc. Place a rack in the middle of the oven and preheat oven to 375 deg F. Line a large baking sheet with parchment paper. Toss oats with oil and spread in an even layer on the baking sheet. Bake until golden brown and toasted, stirring every 10 minutes, about 25-30 minutes total. Remove oats from oven and set aside. Reduce oven temperature to 350 deg F. Toast walnuts and sesame seeds for about 12 minutes, until lightly browned. Remove from oven and set aside to cool. Toss together oats, brown rice krispies, walnuts, sesame seeds, and flaxseed meal in a large bowl. Combine brown sugar, maple syrup, applesauce, and raisin paste in a small saucepan. Cook over medium heat until sugar is dissolved and mixture comes to a boil, about 3-4 minutes, stirring until mixture is smooth and raisin paste is blended in well. Remove from heat and stir in vanilla extract, cinnamon, and salt. Line a 9 x 13-inch pan with parchment paper. Stir sugar mixture into oat mixture until well combined. Press mixture into pan, packing it down as much as you can. Bake until beginning to brown, about 30 min. Cool completely before cutting into 24 bars. Bars can be stored in an airtight container at room temperature for a few days, but to retain the best texture, store in the freezer. Congratulations on your marathon! Your granola bars look delicious. 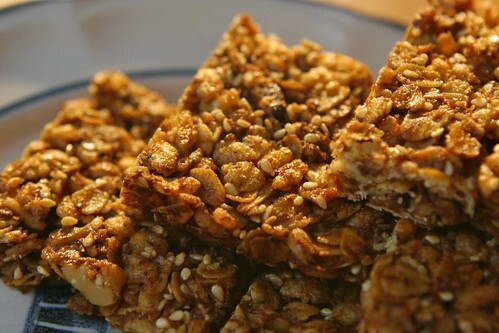 I love homemade granola bars! I like the addition of crispy brown rice - I'm going to have to give that a try. That's wonderful about the half! Good for you. Love this recipe, particularly the addition of puffed rice. Woot woot! I am SO absurdly happy for you! I LOVE marathons, but halfs are my favorite distance. Super challenging but not INSANE. Sounds like you rocked it! 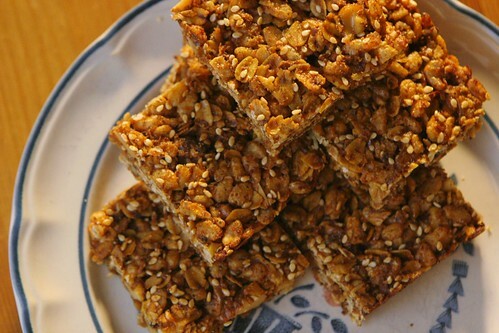 Homemade granola bars for refueling are a great idea! These sound so tasty! Hey Joanne, I really want to do the Run to Remember but I'll be out of town that weekend =(. I'm hoping to do a different one in May though! Congrats! You've been rocking all kinds of big accomplishments recently! Congratulations on your Marathon! You are offering a great gift to your organism with this exercise. These bars can give you all the energy and good mood you need for this! CONGRATS!! i'm sure training was a good outlet during your writing :) these bars definitely sound like ones i'd love to try out! oh yes, running provided some much needed stress relief! Congrats on the race AND on the granola bars! 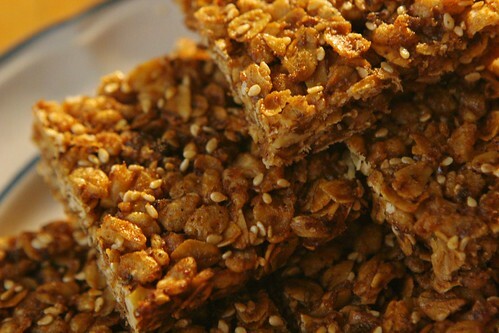 I've tried making granola bars before and always had trouble with them being too crumbly. Will definitely try your recipe next time.